Finishing of door is necessary for protection of the surface of wood. Without finish, a wood can dry, crack or deteriorate. If it is exposed to moisture, door and window shutter may swell and do not operate smoothly. Finishing of doors prevents swelling or cracking. It protects door from stains and enhances the appearance of the wooden door. To avoid weakening and ageing of door, wooden door should be coated with any type of finishing material. Penetrating finishes are absorbed by the wood or easier to apply. It becomes the part of wood rather than remains on top and gives more natural look. You can apply penetrating finish through wiping it on wood, or with brush also. Penetrate finishes penetrate the wood and leave little bit darkening effect, which enhances the natural color and grains of wood. Penetrate finish easily penetrates into wood after 5-8 minutes, after that you can remove the excess material by wiping it through rags or steel wool. Since the penetrating finish becomes part of wood rather than a layer on it, which made wood more strong, hard and more resistant to damage. Linseed oil also known as flaxseed oil. It is a slow drying oil with preservative properties and resistant to water. It is one of the oldest penetrating finishes for wood and mostly used for protection of exterior doors or furniture. However, it tends to become sticky in humid weather. Linseed oil can take days in most cases and remain rather soft for a very long time typically used on outside. Applying linseed oil is easy. Danish oils also belong to the category of penetrating finishes. Mostly used on interior doors and trim. 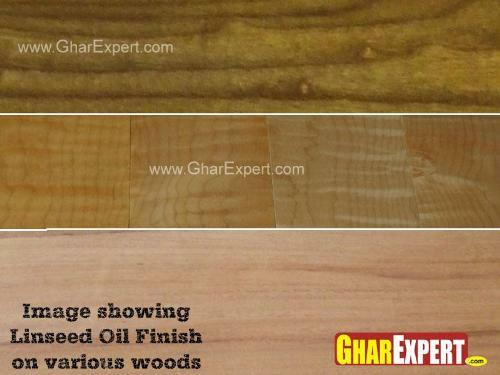 You can use it as a primer or sealer on wood before applying varnish or paint. Danish oil is a combination of Tung oil and varnish with addition of pigment for required color. The application process of Danish oil is same as linseed oil or Tung oil. Danish oil is used as finish or base coat for all types of wood whether; it is used as interior or exterior door, outdoor or indoor furniture, windows, etc. There is no particular skills are required for application of Danish oil. You can apply it whether brush or cloth. It brings out the beauty of wood and leaves soft and lustrous finish after coating. Tung oil is a drying oil, and most durable among all other oils available for finish. It is favorite finish among the woodworkers because it is easy to apply and leaves an attractive or natural appearance. Tung oil is used for interior woods, exterior woods or surfaces used for preparation of food like granite or marble in kitchen. From a long time, Tung oil is used as wood finish, as well as an excellent wood sealer. It is very simple to apply and maintain Tung oil finish. Surface finishes are more durable finish than penetrating finish, but do not offer natural look to wood like penetrating finishes. Surface finishes provide protection that is more durable. It protects wood from water, dirt, and grime or decorates the surface and leaves easy to clean sheen to surface. They provide protection from day-to-day wear or tear of wood and it is a better choice for final finish. There are so many products for clear protective wood sealers in the market and each has different level of protection. The film forming wood top coats have limited penetrating capabilities and remain on top of the wood. Surface finish can be the toughest clear top coats but not necessarily, it is best for every project. Paint is composed of pigments suspended in liquid composed mainly of binder and thinner. Paint is a mixer of pigments, binders, thinners and additives. It enhances the beauty of wood or protects it from moisture, heat, sunrays, etc. Paint helps in protecting wood from day to day wear and tear and easy to clean. 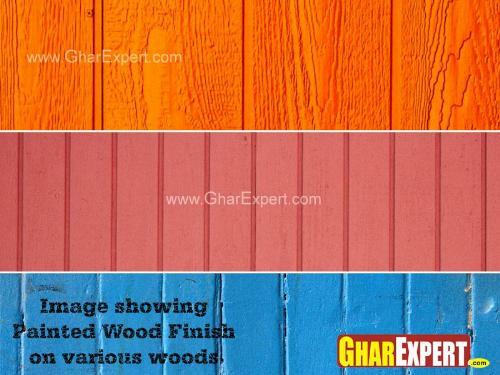 There are two types of paints you can used for wooden doors i.e. ; acrylic paints or oil based paints. Two or more coats of acrylic paints give nice clear finish to wooden doors. Oil based paints are also good for wooden surfaces, but they have slow drying process. You can easily apply paint with brush, foam brush or foam roller. Paint is used as topcoat for both exterior and interior wood surfaces. Varnish is the most traditionally used finishing material for wood surfaces. It is used as protection and decoration of interior wood surfaces. Varnish is mixer of resins, drying oils, driers and thinners in suitable proportions. Resin is gum like substance, which is soluble in water. Varnish is applied on the surface after preparing the wooden surface with the help of brush and other spirit. In market, two types of varnishes are available: based on natural resins and based on synthetic resins. Natural resins varnish includes spar varnish and synthetic resin varnish includes polyurethanes, phenolics and alkyds. 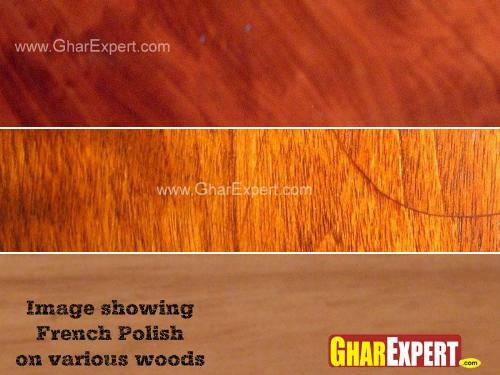 French polish is a process of finishing a wood surface with spirit or other solutions. Finishing like French polish is mostly found on antique furniture. Spirit polish is a solution of shellac and other spirit resins dissolved in commercial alcohol. It dries quicker and leaves harder, clear, glossy, mirror like wood surface than oil varnish. However, wood surfaces finished with French polish may crack or scales off easily. It does not with stand weathering. It is suitable for internal doors and windows, furniture etc. French polishing is lengthy or repetitive process and needs patience or hard work for perfect clear and glossy surface. It is least expensive but the surface polished with French polish may scratch and stained easily. Melamine based finishes are premium quality natural finish coating, available in clear glossy, semi-glossy or matt finishes. They save as a decorative and protective transparent finish to natural wood surface with excellent resistance to scratches and strains from tea, coffee etc. It can be applied from conventional spray or brush on wooden surface. 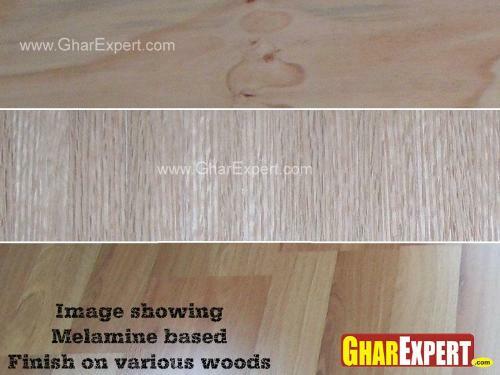 Melamine finishes gets dries very fast and enhances the beauty of wood grains or surface texture of wood. Melamine finishes are available in transparent or opaque finishes. Melamine finishes are also available in opaque finishes. They provide a protective and decorative coating to wood surface and are available in glossy and satin finishes. It gives a smooth or hard surface and resistant to influence of alcohol, water, heat etc. It has excellent resistance from stains, oils, foods and hot beverage. Polyurethane finishes are durable and protective for wood surfaces. It is available in water based or oil based finishes. It gives clear wood finish, which is available in both matt and glossy finish. It gives wood surface a rich and natural finish that enhances the elegance of the wood grains pattern and texture of the surface. They are more economical than melamine finishes. Polyurethane based finishes are durable, scratch proof, strain resistant and easy to apply. 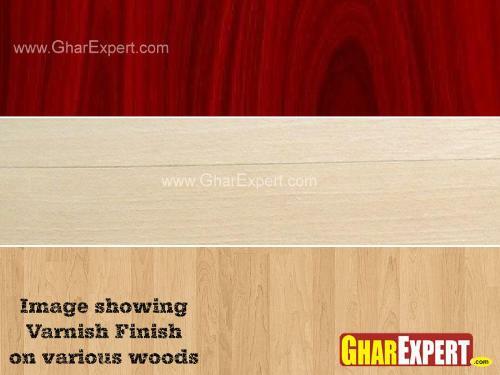 These types of finishes are good for exterior wooden surface of door and windows.